We will visit the excavations of the Roman fort Derventio Brigantium. The auxiliary fort was established under the governor Agricola (40-93) around the same time as Eboracum. MEET AT MALTON, TIME TO BE ARRANGED. As we intend to car share please let c.rousseaujones@gmail.com know if you need a lift or for any further information. 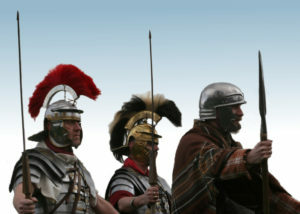 Roman Legionaries during an enactment. Attribution: Agaath van der Oord. This is a great (once in a lifetime!) opportunity to have a guided tour of an excavation in progress by Steve Roskams, site director and Senior Lecturer in Archaeology at the University of York who are undertaking the excavations. Steve has directed sites in London, Tunisia and Algeria, and more recently studied Iron Age and Roman landscapes and settlement on the Yorkshire Wolds and in York’s immediate hinterland. Malton also has some interesting mediaeval history. 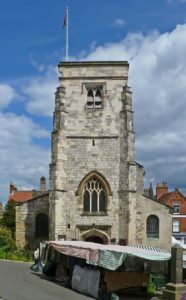 Old and New Malton were established in the 12th century and the Gilbertine monastery/priory was built between 1147 and 1154. 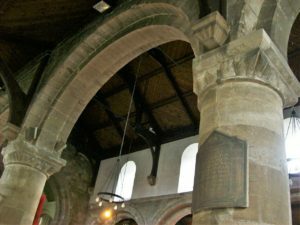 A document in 1283 referenced a market in New Malton and indicated that various craftsmen and others were selling their wares. The Norman built stone castle received visits from Richard the Lionheart, Edward the second and Robert Bruce. However, the castle fell into ruins. That the town’s Assembly Rooms were opened in 1814, a place in which ‘polite society’ could mingle? Does that mean that the folks from over t’ill in Rossendale are banned? That Charles Dickens visited the town and some of the buildings in Malton could have influenced some of his writings in Christmas Carol? Other attractions in Malton include a museum, market place and some houses which at one time were known as the Shambles.